Let me tell you an incredible story about a 40-year quest. It all started with an old note; a note that itself was over 40 years old when it all began. The date on the piece of paper was 1934. It was a note written in my great-grandfather Henry Rosenbaum’s name, from a synagogue in Brooklyn that we’d never heard of. It was among my great-grandfather’s papers, discovered after he died in 1976. It was a note giving the synagogue permission to use and bear responsibility for a family Torah scroll that we’d never heard of and knew nothing about. My family was stunned; my father in particular. What Torah scroll was this note talking about? How is it possible that we never heard about it? 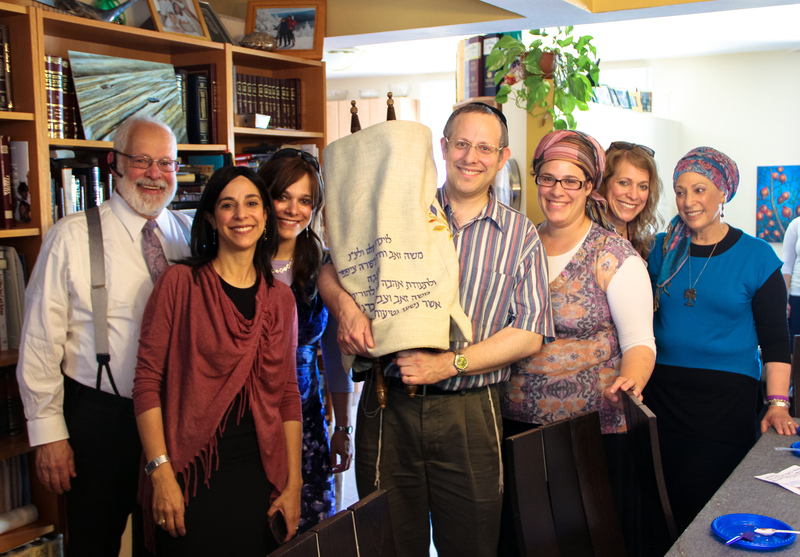 We began asking family members what they could recall of this mysterious Torah scroll from so long ago. They asked my grandmother and her two sisters if they remembered a Torah of their father’s. Between the three of them we were able to piece together the fact that my great-GREAT-grandfather, Moshe Ze’ev Ziffer, who was their grandfather and had lived with them before he died in 1933, had a Torah scroll. In fact Henry, their father, had built a cabinet to hold the Torah. 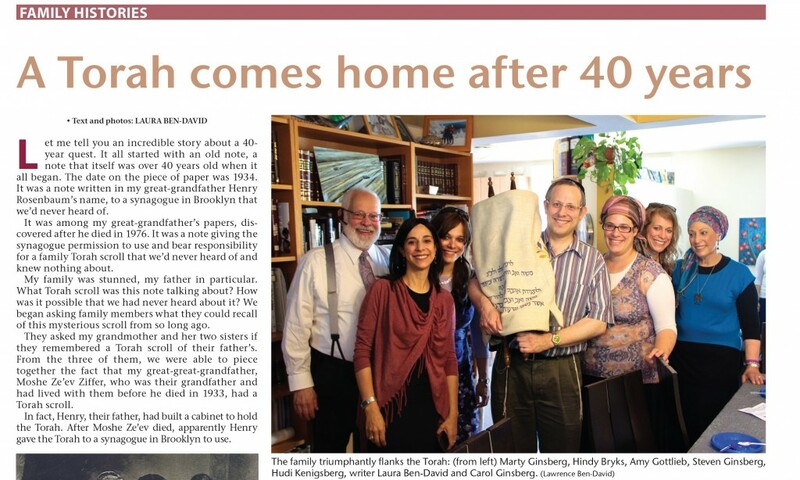 After Moshe Ze’ev died, apparently Henry, now in possession of the Torah, gave it to a synagogue in Brooklyn to use. 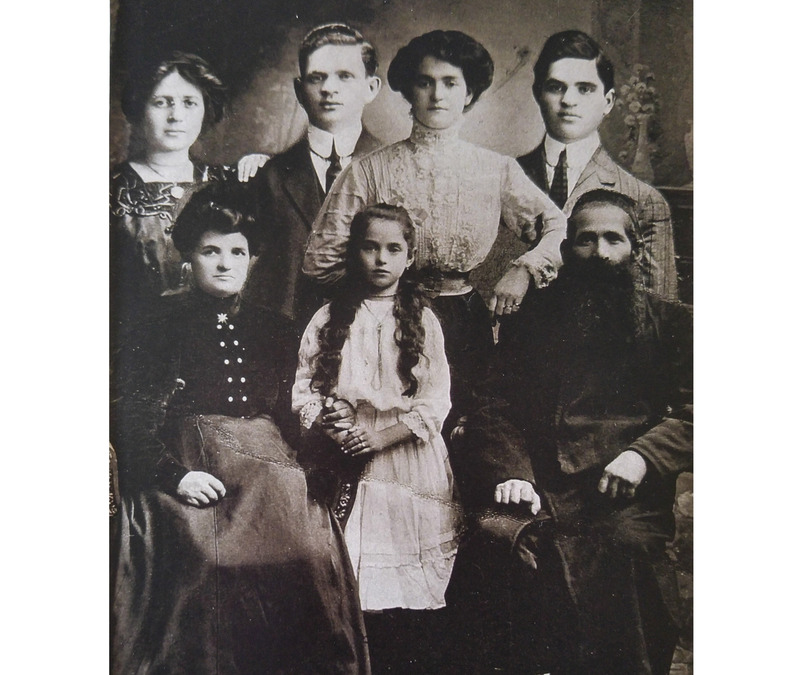 Moshe Ze’ev Ziffer & his wife Chaya Tzipora are seated, Genia Ziffer Rosenbaum, (Henry’s wife and my great-grandmother), is standing second from right. Finding this out was incredibly exciting. We had a family Torah scroll! My dad, Marty Ginsberg – who is also Moshe Ze’ev, having been named for my great-great-grandfather – reached out to the synagogue nearly forty years ago and told them about our claim. They were skeptical at first, but when he sent them a copy of the old letter, plus supporting statements by various relatives and neighbors, they realized his claim was valid. Sure, they told him. You can have your Torah. Just tell us which one is yours. My father was devastated. How could he possibly identify a torah scroll that was put in a synagogue for safekeeping years before he was even born? If the synagogue didn’t know, how could he possibly know? Finally, several years after the initial discovery, my father took a trip to the synagogue with Rabbi Berel Wein, the rabbi of his synagogue in Monsey, NY at the time. Rabbi Wein carefully looked over all the Torah scrolls and determined, based on everything he knew about where Moshe Ze’ev was from and when he came to the States, that it was one or another of the Torah scrolls. Not quite definitive enough. Then nothing happened for twenty years. Finally my father picked up the Torah story again and made new efforts. After my family’s aliyah to Israel in 2002, my father was determined to one day bring our family Torah to our synagogue here in the beautiful Judean Hills. He told Rabbi Betzalel Rudinsky, the rabbi of his local Monsey synagogue, the story of the Torah. Rabbi Rudinsky said the Brooklyn synagogue made a mistake. That it was THEIR obligation to know which Torah was his; not my father’s. And then Rabbi Rudinsky took on the quest as his own. He started going to Brooklyn and speaking with them at the synagogue. He even went to a din Torah – a court of Jewish law. He would go back and have meetings with people there; incredibly things began moving. Every week my dad would ask the rabbi if there’s anything new, and the rabbi would give an update. This went on for a few years. We lost count of how many times my dad said, “I think we might actually be getting the Torah this week!” And then, of course, nothing. Then one day, more than eighty years after the little note was written, and forty years since my great-grandfather passed away, my dad asked about the Torah and Rabbi Rudinsky said, “Oh Shmuel Schneid (a local scribe) has it.” My dad was shocked. We were ALL shocked. After all these years I don’t think any of us really believed the day would come. 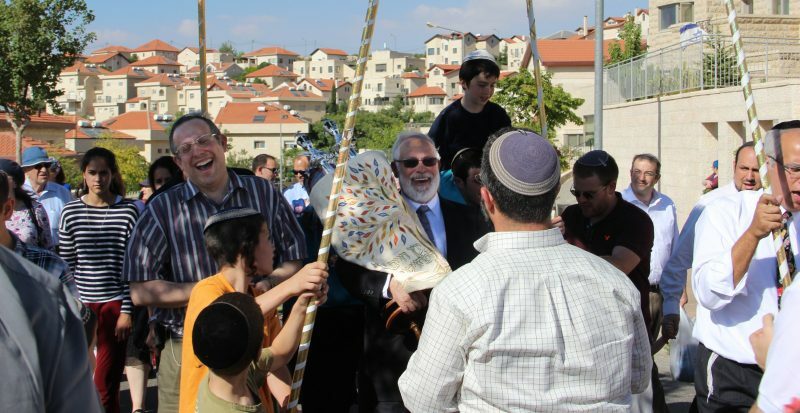 Suddenly we were actually getting the torah! A few days later I was at a Friday ‘shuk’ in Gush Etzion to buy wine and challah for Shabbat. I passed a booth where a woman was selling various handmade items and she said to me, “Are you interested in purchasing a Torah cover?” It was incredibly odd. How many people out shopping on a Friday say “I’ll take two challahs, some chopped liver, and a cover for my Torah scroll…” I almost bought one out of shock. They were beautiful, but were somewhat pricey; and my dad was already arranging to purchase one himself. I made a mental note anyway and took her card. As luck – or destiny – would have it, my parents were already planning a trip to Israel for their grandsons’ bar mitzvah celebrations. And those, mere weeks before my parents’ own 50th wedding anniversary. My siblings and I decided to have the torah cover made for them ourselves and dedicate it in memory of our great, great grandparents, to whom the Torah had originally belonged, and in honor of our incredible parents who have literally planted and nurtured the seeds of Torah for our family. I found the woman’s card and we made it happen. When my parents boarded that El Al plane to Israel with the Torah, I don’t know which one of them was more happy and relieved. The flight attendant had the Torah placed on pillows in a first class closet. My dad sent us a WhatsApp message so we could all breathe easily knowing that after a forty year quest our Torah was coming home. A triumphant, joyous moment as my family, together in Israel, are about to begin the dedication ceremony in Neve Daniel, Gush Etzion, where the Torah will reside; (from left) Marty Ginsberg, Hindy Bryks, Amy Gottlieb, Steven Ginsberg, Hudi Kenigsberg, Laura Ben-David and Carol Ginsberg. Wow! Amazing and so glad the Torah scroll has come home! Thanks so much for sharing this beautiful story. Incredible story! Thank you for sharing!